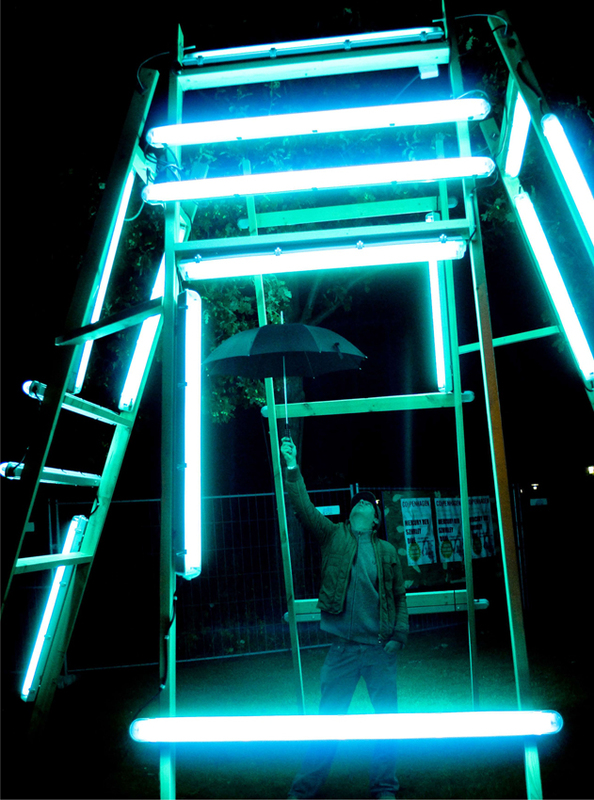 The young design agency Totem Collective, formed by Christina Mejborn and Line Langballe, prepared a very beautiful and interactive lighting concept for the festival with the newest opportunities within the LED lighting technology. The project was implemented in cooperation with the lightcompany Seelite. LED lighting was installed inside windows of DTU’s main building, and LED lamps were integrated into a forest area. 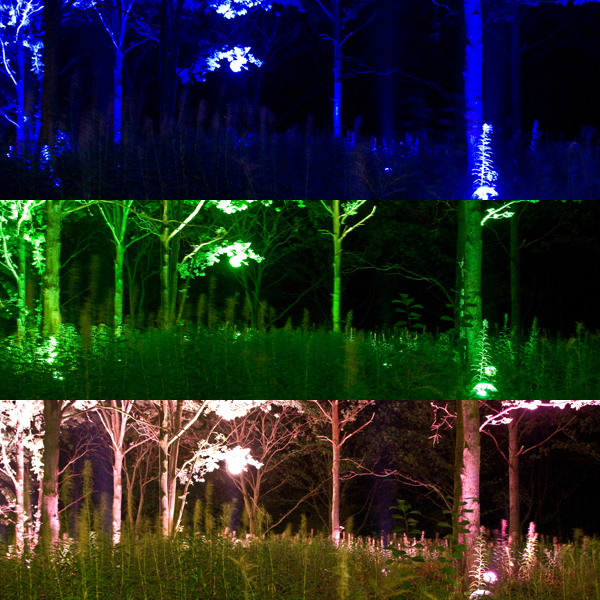 Filament color and beam direction was controlled by sensors that reacted to movement from the audience when they moved around the field in front of the wood. Pretty light-art gave the festival participants the oppertunity to play and experiment with light, and sense the fantastic opportunities LED light creates. A poetic and enchanting image that created a romantic atmosphere at the festival site. 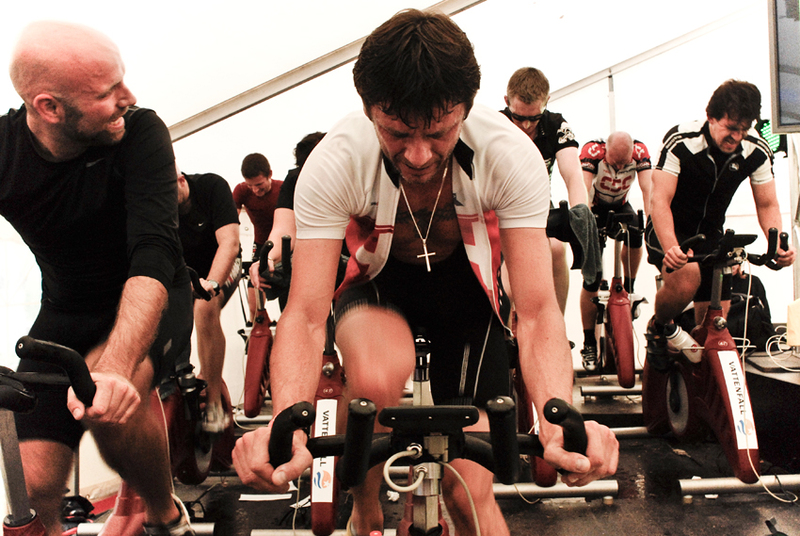 The bike stage was one of the the most popular and successful elements of the festival. It was featured by about thirty national and international media outlets. The bike stage was a great example of innovative performing art in which the audience became the performance. The audience was at the centre, providing the power for the musicians and radio DJs who entertained them. A pleasing synergy between performer and audience and a new form of improvisation in the performing arts. The participatory role play “Changing the Game” was played in the middle of Explore-tent, which was a space at the festival focused on imagining a green future – through exhibitions, interviews, talks, films and interaction with audience. The role play was about prompting the audience to get more involved about thinking about future solutions for the climate and energy. Festival participants were encouraged to imagine scenarios for a sustainable future – and then think about how to make them reality. Guided by a group of PhD students from Risø DTU, called Energy Crossroads, the participants were made more aware of the challenges we face, as they thought through the scientific and economic implications of their ideas. The CO2PENHAGEN cycle parade was a huge procession of cyclists. A vibrant cycling theatre, which invited the audience to cycle the 15 kilometres from the centre of Copenhagen to the festival site at the Technical University of Denmark in Lyngby. The CO2PENHAGEN cycle parade began at Kongens Nytorv with a buffet breakfast, a speech by Klaus Bondam, Copenhagen’ Mayor for Technology. BBC journalist Emma Thomas, who – along with five others — had cycled from London to Copenhagen for the festival presented Mr Bondam with a cycling gift from the Mayor of London’s transport adviser. 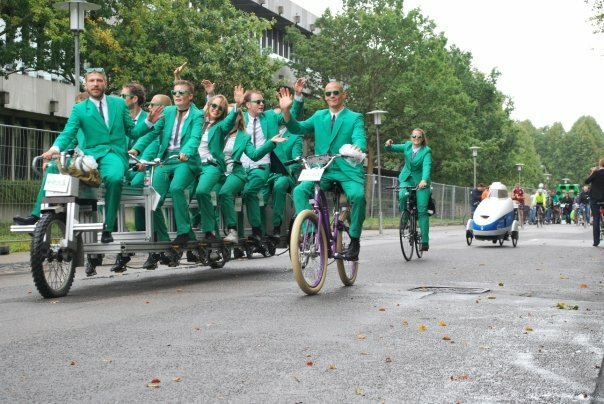 On the journey out to the festival site, the cyclists were entertained by Mr. Green and Karma Kanonen on their musical tricycle. As the party team of green suits arrived at the festival, they took to the stage and gave the opening performance: a climate song. The biogas bus is a swedish-owned disco bus which does regular transport work in the week and travels round entertaining people at weekends. For C02PENHAGEN, the bus was a playground for a ‘climate rap battle’. Thirty people who had won tickets for the C02PENHAGEN joined the biobus, freestyling about climate issues on the Henrik Milling show on Danish P3 radio. The rappers were driven to the festival site on the biobus giving them the opportunity to battle against each other with their climate raps. About a kilometre from the festival site, there was a surprise stop for three well-known Danish rappers to join the bus and lead an event: The Danish sustainable World of Rap. The event was reprised at the festival and broadcast live on P3 radio. This initiative was led by five groups of students from DTU Informatics, who spent a year in the run-up to the festival working out how to use the latest technology in meaningful activity at the event, and create an interactive show which festival participants could attend via mobile phone. Graphics professionals worked with students to disseminate the technology in a fun and educational way. The work led to more interesting projects with possible future applications. These projects invited the festival guests to social interaction, games on the big screen and participation in on-site contests, which could create new social networks within the festival’s universe. “Festival Experience Sharing” invited festival guests to create a profile at the festival’s information-stand. Here they could upload photos and quotes that were displayed on a large screen. In this way, many festival guests shared their experiences with each other, and experiences could be saved for after the festival as well. CO2PENHAGEN had a good size for this pilot project and the idea is that it will subsequently be integrated into much larger festivals. Special barcodes on the festival beer glasses made it possible to save on glasses and offer a faster service at the bar as well! Guests were able to buy three beers at a time; each time the glass was refilled the bar code would be scanned to subtract one more beer from the total. The artist created a beautiful installation with energy-saving lights. A design with lights that painted a beautiful architectural image in the evening’s darkness and mediated through the beautiful art that an energy-saving future is far from boring or uninspired. By Katrine From, Jacob Drachmann, Tobias Øhrstrøm. Construction with low-energy light. 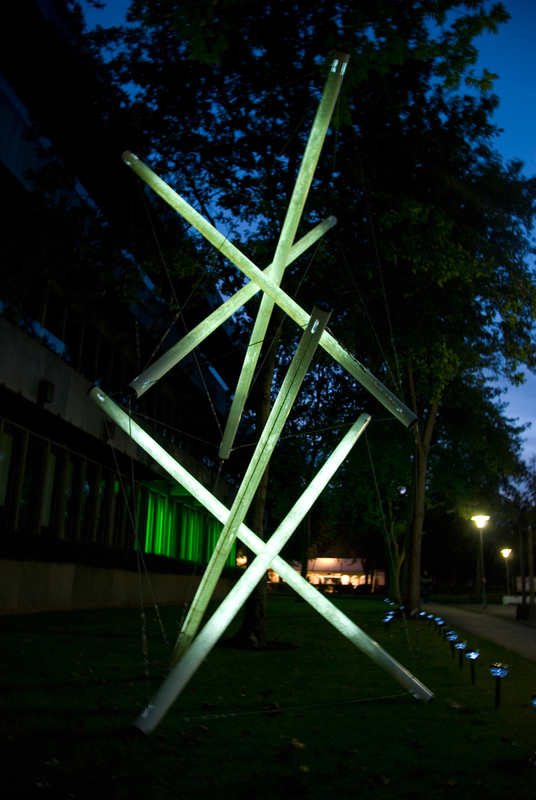 The group made a design out of fibre pipes containing light-emitting diodes (LEDs). The installation could be seen as beautiful, glowing tubes of light in the evening darkness. All materials for the construction were carried by the students on public transport to the site at DTU.